A new trailer for Okja has been released. It was directed by Bong Joon Ho (Snowpiercer, The Host, Mother), and stars An Seo Hyun, Tilda Swinton (Snowpiercer, Doctor Strange, Hail, Caesar!, Moonrise Kingdom), Jake Gyllenhaal (Donnie Darko, Nightcrawler, Everest) and Paul Dano (Love & Mercy, 12 Years a Slave), Devon Bostick (The 100), Lily Collins (To The Bone), Byun Heebong (The Host), Shirley Henderson (Anna Karenina), Daniel Henshall (The Babadook), Yoon Je Moon (Mother), Choi Wooshik (Set Me Free) and Steven Yeun (The Walking Dead). It was filmed in South Korea, Canada and the US, in English and Korean. It will be released on Netflix on June 28, 2017. Check out the synopsis and video below. 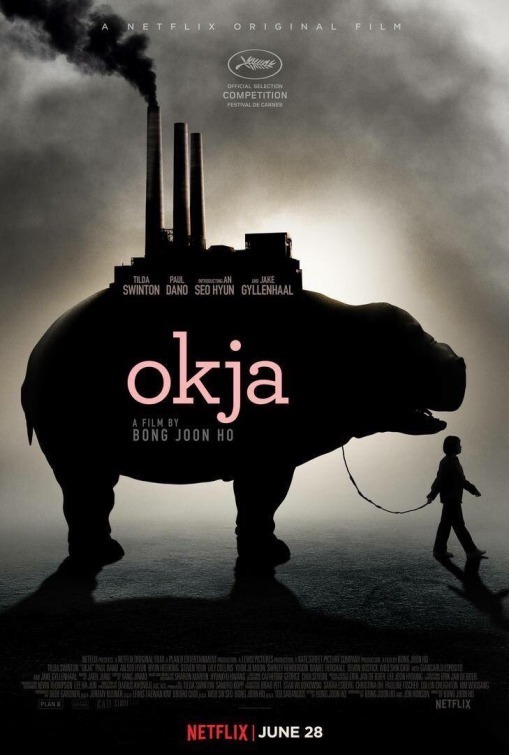 "For 10 idyllic years, young Mija (An Seo Hyun) has been caretaker and constant companion to Okja – a massive animal and an even bigger friend – at her home in the mountains of South Korea. But that changes when the family-owned multinational conglomerate Mirando Corporation takes Okja for themselves and transports her to New York, where image obsessed and self-promoting CEO Lucy Mirando (Tilda Swinton) has big plans for Mija’s dearest friend. Deftly blending genres, humor, poignancy and drama, Bong Joon Ho (Snowpiercer, The Host) begins with the gentlest of premises-the bond between man and animal-and ultimately creates a distinct and layered vision of the world that addresses the animal inside us all."